Unless you’re fortunate enough to be deliriously happy with your professional life, the odds are high that you’ll be looking for a different job in the future. On the bright side, the fact that you’re reading this article means you know how to navigate the Internet — a point in your favor. So how can you use that ‘net savvy to most effectively court the employer of your dreams? Your cover letter and résumé may still be your opening gambit, but the life you lead online increases in relevance every day, especially as a resource for potential employers. 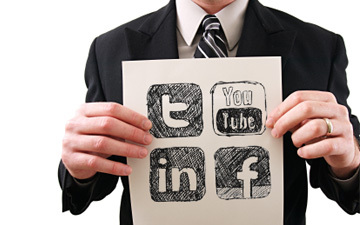 Companies are turning to social networks and media more than ever. A recent study suggests that nearly 90% of companies will use networks like LinkedIn, Facebook and Twitter for recruiting, and that nearly 80% will review a candidate’s online presence and behavior before making a hiring decision. Since social media presence will likely be investigated and considered prior to your next hire, you’re going to want to put your virtual house in order. The first step is a matter of common sense, but nonetheless a vital task: Do not make an idiot of yourself online. One would think this advice is hyper-obvious by now, yet it seems that all too often we encounter a new article profiling an employee’s shortsighted tweeting or a large company’s bafflingly insensitive Facebook status. A golden rule of television is, “When in doubt, your mic is always on.” The same applies to the Internet: Everything you post, tweet or comment on is being recorded, and will come back to haunt you. Not to mention, if a tweet can get you fired, it can also prevent you from being hired the next time around. On the flip side, however, is the danger of being too careful. While you’ll want to avoid putting up those incriminating and obscene photos from your Vegas bachelor party, don’t let fear prevent you from posting anything at all. An employer will be looking for a candidate who is social and outgoing, who has a demonstrable knowledge of networking and communication. They’ll also be looking for somebody with character, who stands out from the crowd. If all you’ve shared are the same bland qualifications that are already attached to your résumé, your potential employers won’t have the excitement of learning something new about you. Be bold, be opinionated, be unique — just do it without cursing or detailing your hangover symptoms. Take a tip from Nicholas Allegra, the iPhone “hacker” known better as Comex, who turned his notoriety into an internship with Apple. When crafting a proper online appearance, you’ll have better luck sharing the right things once you’ve shared them in all the right places. Twitter and Facebook are essential platforms, but at a bare minimum, you should also maintain a fully fleshed-out profile on Google+, LinkedIn and About.me. Get your name out to as many sources as possible — you’re building strong SEO for a vital product: yourself. When an employer Googles your name, make sure that the first thing they find is a result you’ve handcrafted for their perusal. You may even wish to secure your own domain name and build a website about yourself. Witness the efforts of Eric Romer, who launched a blogging campaign that proclaimed his eagerness to work for a company (he was hired a day later). Or take a tip from Louis Gray, whose demonstrated love and dedication for Google+ got him hired as a product evangelist. This leads directly to the next tip regarding your online activity: Don’t be afraid to actively engage the company you’re courting via your tweets and status updates. Any business actively checking a potential hire’s online profile will most certainly have a social media presence of its own. Therefore, start following its tweets, “like” it on Facebook, etc. Be careful on LinkedIn, though; it’s something of a faux pas to add someone to your network if you don’t personally know him. Still, nobody says you can’t check out the LinkedIn groups and communities to which he belongs. While you’re at it, don’t forget that a company’s social media isn’t just a place to make yourself heard — it’s also the perfect opportunity for you to observe the company’s actions. How is the company interacting with the public? What insight can you glean from its tweets and statuses? What kind of culture does it display, and what are its subjects of interest? Take meticulous notes, because these are the kinds of things you’ll want to keep in mind when sitting in the interview chair. Start reinforcing your digital persona now. In the coming years, companies and recruiters will only become more thorough when evaluating new candidates’ online behavior.